Project Office is situated in Business Incubator of Medical University in Lodz which is an university-wide unit, supporting the development of local businesses and other entities of economic and social environment. All in vivo activities are performed at the Laboratory of Molecular Basis of Medicine. In this laboratory there are three separate areas (two areas for cell cultures, each with 2 incubators with CO2, laminar flow chamber, a centrifuge, a water bath, fridges and laboratory equipment) and cell biology laboratory with a fluorescence microscope with the chamber for real time testing. In the Laboratory of cell and tissue cultures there are 2 low-temperature freezers (-80°C and -150 C), the fume hood, analytical balances, an automated cell counter in culture, PCR and real-time machines. In the neighboring Laboratory of Molecular Biology can be carried out the DNA and proteins electrophoresis, automated electrophoresis on the LabChip plates, PCR reactions, analysis using ELISA plate reader, gel documentation system or spectrophotometer. The group has constant access to flow cytometer and VICTOR luminometer also. 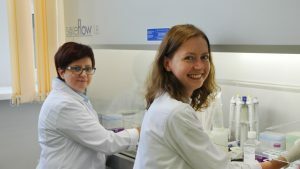 One of the crucial areas are scintillation-based experiments which are conducted in Isotope Laboratory, Institute of Microbiology and Immunology, University of Łódź. Evestra Onkologia in vivo projects are performed in Animal Facility of the Faculty of Pharmacy, Medical University of Lodz. The animal facility is registered in the National Ethical Commission’s register at the Ministry of Science and Higher Education. It is included in the list of breeding units for laboratory animal rats and mice (nos. 049) and in the list of entities authorized to carry out experiments on animals, e.g. during pre-clinical testing of newly emerging drugs. Number in the ministerial list for the whole experimental unit: 0061. The Animal Facility has the consent and authorization of the Minister of the Environment for the contained use of GMOs and can acquire transgenic mice since 2013. It is a registered genetic engineering company. Management system according to ISO / IEC 17025: 2005 standard, based on ISO 9001: 2008 is implemented.